Enjoy a double bill of rugby at Welford Road on Saturday as Leicester Tigers host European Champions Cup and Academy League fixtures. Consult our Matchday Guide to see what’s in store. Tigers welcome Ulster Rugby in the sixth round of fixtures in the Heineken Champions Cup at 3.15pm and then protect an unbeaten record in the Academy Under-18 League against Yorkshire Carnegie at 6.00pm. Look out for team news and previews on the club website and social media pages in the build-up to the weekend, including an LTTV interview with Graham Kitchener and the views of Tigers head coach Geordan Murphy. On matchday, all stadium turnstiles, bars and food kiosks open at 1.45pm. The Junior Tigers Club area in Final Whistle is open for two hours ahead of kick-off and provides a chance to win a FREE place as a matchday mascot or Tiger Cub, as well as enjoying a visit from members of the playing squad before the game. JTC membership is free to supporters age under 16 and you can sign up your youngster now by clicking here. Supporters can also hear from inside the Tigers camp with a player Q&A in Final Whistle at 2.00pm. The stadium has a selection of food kiosks with options including the pie-and-pint offer in the Holland & Barrett concourse, Mattioli Woods Stand and Breedon Stand; and Domino’s Pizza in the Holland & Barrett Stand upper and lower; and chips in the lower level of the Holland & Barrett Stand and in the Robin Hood Stand. There are children’s food offers, too, at the Junior Tigers Club food unit in Final Whistle. Teams from junior clubs and schools join us as Tigers Flag Wavers and the Guard of Honour on the pitch as the teams prepare to run out and you can find out how to follow them in the remainder of the season by phoning the Group Sales team at Tigers on 0116 319 8888. Sunday’s 100-page match programme includes a chat with newcomer Leonardo Sarto, a spotlight on the teams in pool 4 of the Champions Cup, the Junior Tigers Club pages, Fanzone photos and news from inside Welford Road. Pick up your copy around the stadium, price £3. Please note that bag searches are in place at the turnstiles. Supporters are encouraged not to bring bags to the stadium but, if you do, please allow extra time to get through your turnstile and into your place ahead of kick-off. Banned items in accordance with stadium regulations include flagpoles measuring more than one metre, bottles, cans, large umbrellas and any bags that will not fit beneath a seat. More information is available on boards at all turnstiles. You can use the ‘Big Screen’ function on the Tigers app to submit photos of your matchday and a selection will be shown on the stadium big screens. Official matchday bus services run by Centrebus are in operation on routes from Market Bosworth, Market Harborough and Oakham, arriving at Welford Road half an hour ahead of kick-off. For full details, including timetable and pick-up points, click here. Half-time entertainment on the pitch includes The Ultimate Big Boot and we’ll name this week’s TigersLotto season ticket winner and the Lumbers Player of the Month as well as welcoming participants in the day’s Tigers Matchday Coaching Clinics. 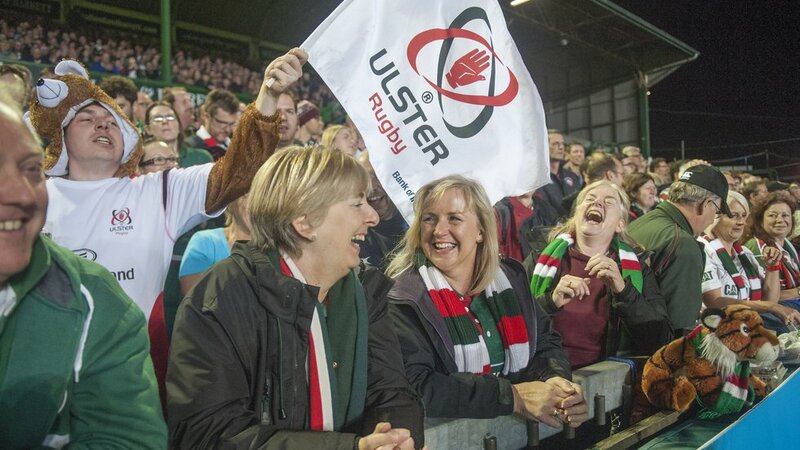 After the Champions Cup match, there is live music in Final Whistle with resident band Rock Bottom, and the main Club Store and ticket office will remain open for an hour. Match tickets for Saturday are still available. Book in person at Welford Road, phone 0116 319 8888 (option 2) or online. There is a print-at-home option for tickets bought online. Or there is a Collection Point on the plaza outside the Holland & Barrett Stand if you are picking up pre-paid match tickets on your way to the game.